Ireland celebrate after Conor Kindregan's try. IRELAND HAVE WON the Dalriada Cup for the first time in five years, despite having to settle for a draw against Scotland this evening. After defeating the Scots on a 23-9 scoreline at Netherdale seven days ago, Morgan Lennon’s side took a 14-point advantage into the second game of the series at Energia Park in Donnybrook. A try from Robbie Nelson after just 45 seconds got the visitors off to the perfect start, but two successful penalty attempts from Cork Con’s Aidan Moynihan left Ireland trailing by the bare minimum on the night at the interval. 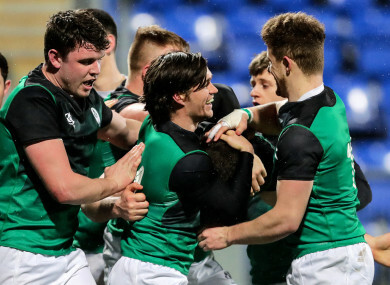 Ireland stormed into the lead in the second half thanks to a try from Conor Kindregan, with the reliable boot of his clubmate Moynihan giving the home side a 19-12 lead after Kyle Rowe grabbed Scotland’s second try of the evening. With two minutes remaining, Scotland scored again through Pete McCallum and Gregor Hunter tied the game with the conversion. However, it wasn’t enough to prevent Ireland from claiming the series silverware. IRELAND: Eamon Mills (Lansdowne); Daniel McEvoy (Lansdowne), Niall Kenneally (Cork Constitution — captain), Matt D’Arcy (Clontarf), Michael Brown (Clontarf); Aidan Moynihan (Cork Constitution), John Poland (UCC); Tom O’Reilly (St. Mary’s College), John Sutton (Buccaneers); Ian Prendiville (Lansdowne); Brian Hayes (Cork Constitution), Conor Kindregan (Cork Constitution); Michael Melia (Terenure College), Dan Walsh (Young Munster), Luke Cahill (Cork Constitution). Replacements: Liam Cronin (Garryowen), Cronan Gleeson (Old Wesley), Adam Coyle (Naas), Jack O’Sullivan (Lansdowne), James Murphy (Cork Constitution), Alan Bennie (Lansdowne), Callum Smith (Malone), Jack Keating (Old Belvedere). Email “Ireland Clubs claim Dalriada Cup after Donnybrook draw with Scotland”. Feedback on “Ireland Clubs claim Dalriada Cup after Donnybrook draw with Scotland”.